In all my nearly twenty years as a poet and writer, I’ve never believed in writer’s block. And this isn’t a piece expounding on how I suddenly found myself staring into the blank Microsoft Word document glowing back on my laptop, how my fingers froze, or how some unfelt before fear from the Great Beyond had turned on the faucet and I started sweating profusely. No, I still don’t believe in writer’s block. But it believes in me, and it almost hit me nonetheless. Hard. As many of you probably know, since March of 2013, I’ve been writing a series of mystery novels under the auspices of “Hipster Noir” on the PATH train during my morning and evening commute to work. Three novels later, over 200,000 words, and one proposal to pitch them all to an agent or publisher, I’m still going strong with my fourth novel, The Curious Case of Tomorrow (Or, The Trouble with Time Travel). But this fourth novel, which is a direct continuation of the third, the way Quantum of Solace is a continuation of Casino Royale, started making me second guess some things. I would still get on the PATH train from Grove Street in Jersey City to the World Trade Center stop on the other side of the Hudson, and my fingers would still go to work with my iPhone music library shuffling between Tom Waits and Gin Wigmore, with an occasional Lykke Li ballad or Pearl Jam anthem cutting in over the seven-minute or so ride. This time, however, felt different. I knew that I was really searching blindly for a spark. Now I can’t get too detailed here because I’d have to divulge what my fourth novel is all about, and I haven’t even published any of the first ones yet, but this was the first time over the course of almost thirty-six months that the writing was not yielding anything that I was getting truly excited about, the way the first three novels had done. The Writer’s Block. And yes, I capitalize it like a proper noun ‘cause it deserves a proper level of respect. Anything that pushes us to become better writers does. The way I see it, we are the ones who create the Writer’s Block, by pouring out so much of who we are and what we are in our writing. At one point, we run out of things to write. 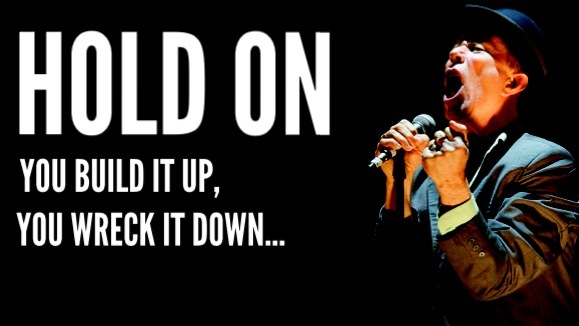 But as Tom Waits sings, “you build it up, you wreck it down…” in a song appropriately titled “Hold On,” that’s exactly I did. I gave it form, shaped the shapeless into something that, in time, and once I found its weakness, I could hope to break right through. Back to my Curious Case of Tomorrow. Amid my searching within not one, but two separate timelines that this new novel has split into; after figuring out that what I was writing this time around was no longer a mystery novel, but a science-fiction spaghetti western (if there’s even such a thing); when I finally surprised myself one day riding that iron horse through those morning and evening tunnels humming with the electricity of possibility, I knew I had finally blasted right through that ‘Block. I had found my voice. Again. Then I realized that it wasn’t the first time this ever happened, but it was the first time I became aware of it’s happening. And I dealt with it. The Writer’s Block isn’t a stumbling block, it’s an uncarved block. It doesn’t necessarily have to stop your creativity. It’s not the blank page we stare blankly at, but the page that stares at us and pushes us to shut up our minds and write anything, which proves to be the most frightening thing for us writers –– to write without purpose. Without saying anything. Writing for the sake of writing. Of calling ourselves writers. 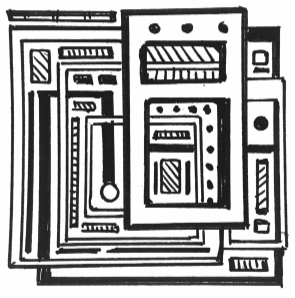 The Uncarved Block, or Pu, as Taoist abstract art. But at least we’re writing, and in doing so, we’re showing that ‘Block whose boss. Not enough of us do this. We hit the ‘Block and we wait for the right words. We complain about it on Facebook. We may go out with our friends to forget about that blank stare for a few hours. And each of these may actually work (or seem to work) to get you back on track. But to find the right words, you’ve got to write down the words. It’s the Taoist principle of Pu –– the Uncarved Block. Though this particular tenet tells us we should let the world carve us into what it wants. From a writerly perspective, we simply need to start with a vague idea and the raw materials of what needs to be said and then hack out the words that don’t add to it. This way, all we’re left with are the ones that do work, and which will resonate and be remembered long after they’re read. They’ll also be the ones that will remind us why we started writing in the first place.